My favorite Florida Keys Captain has an article in the latest issue of This is Fly. It's all about winter Tarpon fishing in the Florida Keys and catching that first tarpon of the season. It's good to know that your guide still gets excited about a day off fishing for Tarpon. 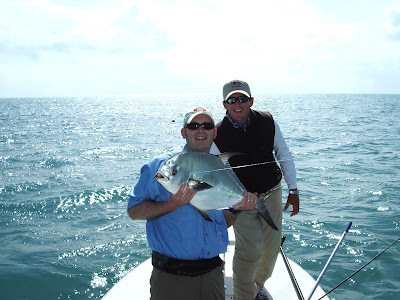 Several years ago, Drew guided me to my first (and only) permit on fly. We haven't fished together in several years, but I'm looking to change that this year. Hopefully he will put me on my first Tarpon later in the year, but more on that to come. First, the Bonefish Flat is gonna take a detour down south. Way south. To land a few bonefish and shake the shack nasties. 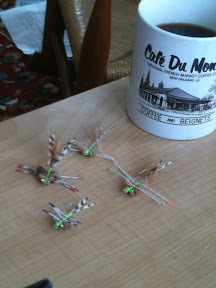 Worked at the vise last night and came up with a few Merkins and a few of Greg's Flats Flys, with my own twist. This morning I'm just pondering crabs, bonefish, and my coffee. I had a great afternoon today. Even though the weather was cold, I watched Phil Mickelson play Pebble Beach and really deliver a fantastic round. The 18th at Pebble is my favorite hole in golf. What's not to like? The Pacific Ocean on your left. Trees in the middle of the fairway, and the hole is daring you to go for the par 5 in two. That's a golf hole. All the while I was sitting at the vise tying up some gotcha's, blind gotchas, and some bunny gotchas. I thought I had my fly box sufficiently overstocked for my upcoming trip. And then, I see Dr. Aaron Adams post this fly, the Big Ugly. Simple Flies: Big Ugly from Aaron Adams on Vimeo. Gotta get the vise back out. Inspired by O’Keefe’s bonefish podcast, it was only fitting we talked extensively about flats fishing. One thing I admired was how he keeps simplicity at the fore- front. As I prepare for an upcoming bonefishing trip, I was curious how Brian gets ready for his trips. I asked about some of his favorite and essential gear. Because Brian has extensive camera gear and some computer equipment, he has to pack smart on the fishing gear. He throws in a few extra hats and a good lightweight but tough waterproof jacket and some spare battery packs. With regard to hooks, he likes “a sharp one.” When asked his favorite rod and reel combo, he doesn’t really have one other than a fast action rod. He has never bought a very high-end reel, either. He does place a high value on his fly line and a finger protector. “So if you could pick one spot to fish, and had to pay for it yourself, where would you go,” I asked. “The Seychelles is one place that is on the bucket list, but living in Oregon it literally is the furthest place away from home.” He cited a huge variety of fish species, as well as a shot at monster bonefish. Cuba is another destination high on the list because of big bonefish and tarpon living on relatively untouched flats. He noted that Castro actually set up the Jardines de la Reina and only a limited number of rods are allowed to fish at a time. This means a lot of big, dumb fish in a beautifully protected environment which he saw first hand as he had a chance to dive some of the reefs. For someone like me who writes a saltwater fly fishing blog, I couldn’t resist asking Brian his advice on how to break into the outdoor writing and photography business. He said traditional media is not that easy. With photography, it is really hard these days because there are so many people in it and a lot of seasoned professionals out there that publications rely on. He recommended, as I’ve heard before, combining writing and photography because it’s easier for an editor to go to one place to get what they need for a story. With regard to writing, “just keep doing it. Write as much as you can. Try your local fly fishing newsletter.” He said a lot of guys get started doing regional or local fishing coverage. He thought outlets like blogs are a great way to get into the business because they let you practice and really work on the craft. To wrap up, we talked about a memorable fish. Brain told the story of fishing in the Berry Islands with a guy who was really impatient and would get on the bow and just cast over and over again. “A real Type A busy body. Then, he wanted to try my rod.” Reluctantly, Brian agreed and the guy started casting wildly. Later, it was O’Keefe’s turn on the bow and he hooked a monster bone that he thought was at least 31 inches. The fish would eventually break him off. After examining his leader, he noticed a series of wind knots that his “fishing buddy” had put in the leader. O’Keefe also said one of his biggest bonefish was caught on Long Island, Bahamas. He was wading and wading a big area in the north of the island near a big blue hole when several big bonefish came along. His fly led the fish by 15 feet but the school just spooked. He then got the idea to set up a type of bonefish stakeout by returning the next day and semi-burying the fly in the sand. Sure enough, the same school came back, he gave the fly a twitch, and landed an 11-pound bonefish in a method that sounds to me like setting a bonefish landmine. Brian is the real deal and a truly great ambassador to our sport. I hope I get the chance to share a boat with him one day. Quite simply, the guy just loves to fish and it shows. 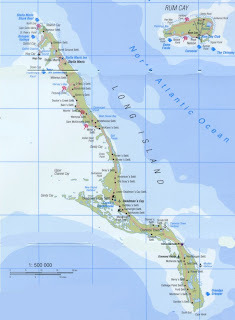 Several years ago I heard a podcast featuring Brian O’Keefe describing the different fishing opportunities in the Bahamas. 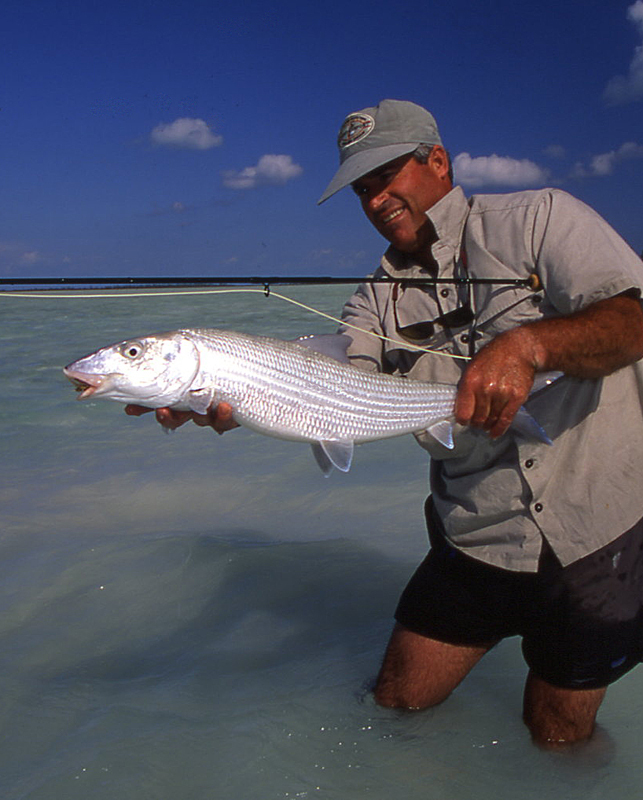 From giant bonefish mistaken for cuda’s near Moore’s Island to countless numbers of fish in Andros, Brian painted a vivid picture of a bonefish nirvana. 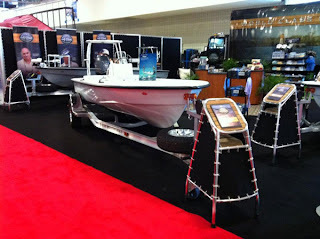 I already had a passion for fly fishing and my interest in flats fishing was just sparking. Brian’s depiction of the Bahamas was like pouring gasoline on this spark. 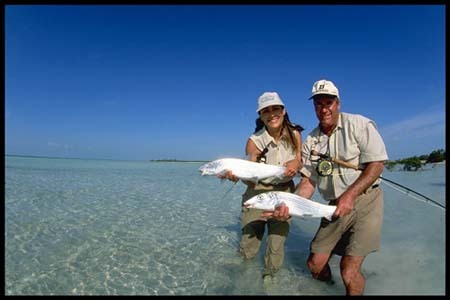 Fast forward to today and The Bonefish Flat has been up and running for almost three years. I’ve had a chance to interview some great personalities in saltwater fly fishing including Aaron Adams of the Bonefish & Tarpon Trust and Chris Peterson of Hells Bay Boatworks. Last week I finally had a chance to talk fishing with Brian O’Keefe. For those of you who don’t know Brian, he is half of Catch Magazine and oversees the content. In addition to Catch, Brian is an amazing photographer who has fly fished the world and taken some spectacular pictures along the way. Whether you know it or not, you have doubtless seen his work in your favorite fly fishing magazine. It will come as no surprise that when I talked to Brian, he was getting ready to head off on a trip to Mexico where bonefish, tarpon, permit, and snook were on the agenda. You might know that Catch is going to switch over to a subscription service. “I talked to hundreds of people all over the world to get a feel for what a fair price point would be. I settled on $12 per year, just $2 per issue,” Brian said. We discussed the changing attitudes toward paying for online content. While many of us expect online content to be free, you now see a growing number of Web sites charging a subscription fee. The New York Times and the Wall Street Journal come to mind. O’Keefe agreed stating that he and his partner, Todd Moen, spend a huge amount of time putting Catch together and without some sort of compensation, keeping Catch going would be in difficult if not impossible. When asked if he had a favorite photograph from Catch, Brian didn’t hesitate, “The permit from episode one. I get accused of “altering” it, which of course means photoshop. But I took that picture using 35 mm film, and there was no altering going on. The conditions were just right to provide the natural colors and effects,” he said. There is a great podcast up on Orvis News featuring Brian O'Keefe talking to Tom Rosenbauer about how to take better pictures. In a way, Brian is partly responsible for this Web site. Several years ago he was on an Ask About Fly Fishing Podcast discussing bonefish in the Bahamas. Listening to him describe bonefishing was like pouring gas on the flats fishing fire and really helped to get me hooked on bonefishing in the Bahamas. Brian puts together Catch online magazine and it is my favorite online magazine. The photo's are the best fly fishing photos you will see and I always look forward to the new editions.